Volcano National Park, Rwanda. We were split into groups of eight and each group followed their guide to a jeep. We sat facing each other in a compartment behind the front seat. I did all I could to stem the tide of claustrophobia arising in my psyche. After a little over an hour on rough roads, we all piled out to find we were in a rural village. We followed the guide past huts and gardens to the end of the dirt road where a group of men puttered about with walking sticks. For twenty U.S. Dollars, a man would serve as your porter. My heart soared. With my camera and water bottle in safe hands and a walking stick in my hand, I followed the guide up a wide hillside where we walked around rows of planted crops. In the background, was a mountain covered in mist. The bright sun scorched us. We reached the top of the planted hillside and entered a more forested area. The tall grass and shrubbery were lush and wet. I was thankful to be wearing gators. I enjoyed the designs in the plant life as we lumbered along. I was even hopeful we would catch a glimpse of a live gorilla in the wild. The sun could not daunt my excitement. After about ninety minutes of ascending into the wet forest, the guide told us to leave our walking sticks with our porters and take only our cameras. Anticipation made me gulp. We must be close! We ever so quietly followed the guide for an hour of trekking up and down hills of tall, thick vegetation. We didn’t have any long distance view any more. The prickly nettles that we had been forewarned about became a constant reality. I reminded myself that you can never be too certain about where wild animals will chose to be on any given day. I was toward the end of the line, focusing on my surroundings and trying to keep my hopes up. It sounded like the guide must have turned around to come toward me. 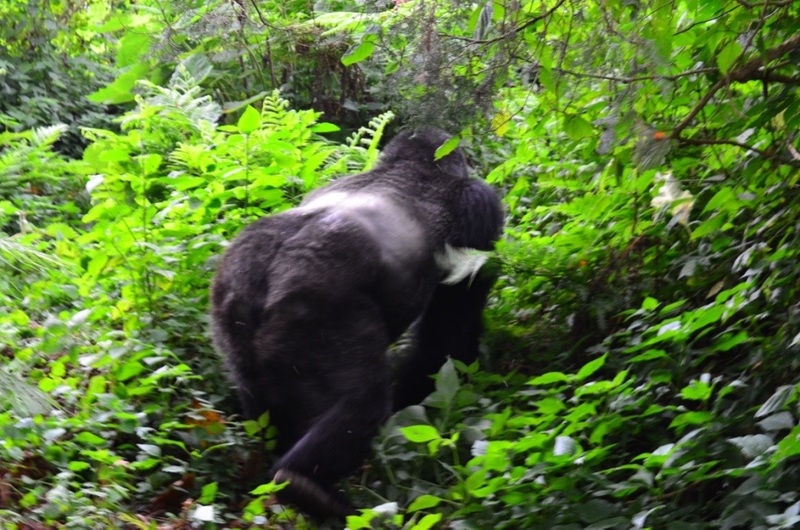 Instead, about twelve feet uphill from me, a silverback Mountain Gorilla came out of the bush. I didn’t think they would be that large. This big gorilla was taking long, measured steps down the hill toward me! I had been told they would charge if you ran. I had been told they would not attack. What was happening? Within in four inches in front of me, the huge, hairy beast turned right and disappeared into the bush. I didn’t get any photos but WOW. We were lucky. 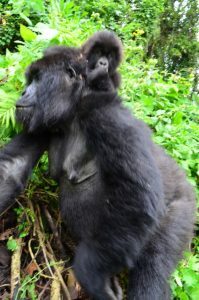 We saw seventeen gorillas, including a mother with a baby riding on her back. And while we were looking for them, it seemed more that they found us. 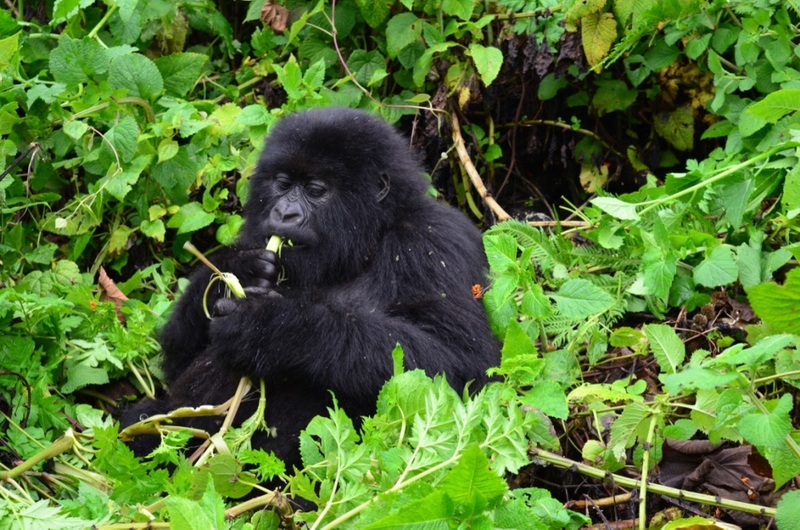 You get sixty minutes from your first gorilla sighting before you need to depart. As I was leaving, a young male popped out of the bush, parked himself four feet from me and began to eat a twirling green stem. He looked at me but showed little concern that I would challenge him for his snack. I took out my camera for a final shot. Rwanda was far from home, but it was worth the trip. P.S. If you are planning a trip to Rwanda to see the gorillas, I recommend reading Dian Fossey’s Gorillas in the Mist. I was glad I had read it before leaving home.